BUILDING YOUR BRAND & “THE 5 MINUTE OPEN” – Take it for a Test Run! A 5 minute phone call to the clients you’d like to duplicate, your qualified clients, is all it takes to begin effectively branding your business. We call this phone call “the 5 minute open” and we give it to our clients during the first weeks of the initial “60 day plan”. Here’s what we know. Financial Advisors whose BRAND is to freely share what they know with their clients – being of service, not sales – see their businesses grow dramatically. Because when you practice the concepts of free and giving with your best clients, the clients you want to duplicate, you separate yourself from the crowd. You become remarkable. By freely giving your advocacy, your knowledge and your time, you build a completely different framework for growth where many of your clients will want to reciprocate and advocate for you. By making giving a foundational element of your brand, your mission is something to which people respond. And it gives your clients and prospects something different to think about… and that is what sets your service and you apart from the rest. It’s how you make yourself remarkable. Now, we understand that “reading” about something that can elevate the growth of your business is different than “feeling” it. 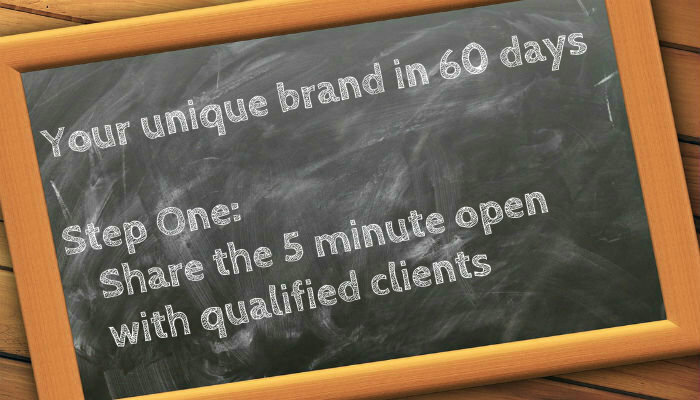 So, as part of our free business consultation, we give you the “5 minute open”. You can take it for a test run to see what kind of response you get from your clients. It’s only a couple of brief paragraphs and because it’s a phone call, you don’t even have to memorize it. Our bet is you’ll get incredibly positive results. And it’s so simple. If you are an Advisor with a book that includes mass affluent clients with a $500k – $2.5MM net worth, you should be using the 60 day rule to grow or deepen your business in this market. The Bellis Method™ is a marketing mentoring system that simply and effectively teaches Advisors how consistently be in front of 1-4 new qualified high wealth prospects every month. It’s what will set you on the path toward dramatically increasing your income and the value of your business for the rest of your career. The Bellis Method™ starts with a detailed, targeted analysis of your client base and, at the same time, the development of your marketing story. This precisely crafted story connects you with clients in a uniquely compelling way that opens doors to greater access. It is the cornerstone to this marketing process and within 60 days you will develop your first client advocates, champions who will introduce you to their qualified friends, colleagues and family. We continue with steps that teach and mentor our clients, who are already good advisors, to be excellent marketers. You will see progress as you begin learning the steps, speaking with us on a regular basis, one-on-one, several times a week, as we guide you toward your goals. 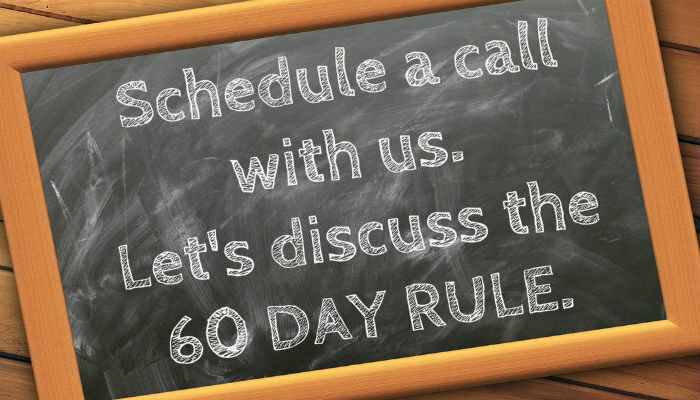 So take the first step – let’s have a conversation to discuss if the 60 Day Rule is right for you. It’s what we do. It’s what we’re good at. OK, so we posted that last week and many of you contacted us, with comments like “What?”, “How?”, “Come again?” So this week we’ll expand a bit on what we said. We certainly know that Advisors of all income levels should absolutely be able to achieve very significant growth in new, warm qualified activity and first appointments in 60 days. We also know that the vast majority of Advisors are very frustrated because they haven’t EVER been able to create a consistent stream of quality introductions and qualified first appointments, despite all the expensive programs, coaching and books they’ve tried. To reiterate, our Advisor clients typically achieve significant and measurable increases in new warm qualified activity and first appointments in 60 days or so. At the same time, when it comes to you developing your business, you need to address your own limiting worldview. In this case it’s about skepticism. Most Advisors we work with readily admit to having been skeptical about anything new or different because they have been burned by expensive “sales guru” programs and sales oriented marketing programs. This needs to be checked at the door because it limits your opportunities for success. Next is creating the most important story you’ll ever tell. It’s a marketing story that bears no resemblance to any story you’ve ever told before. It connects you with clients and prospects in a uniquely compelling way that opens the door to trust, access and new warm qualified introductions. That’s the beginning, accomplished in the first two weeks that we work together. Most importantly, ours is a marketing approach built on service, giving, reciprocity and permission, not sales. 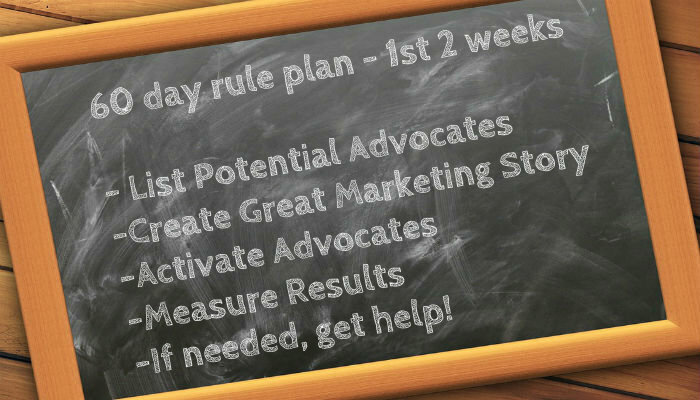 Mentoring and training Financial Advisors to be effective marketers is what grows an Advisor’s business exponentially. What we teach is a simple, highly effective learned skill that will begin to provide positive results within 60 days. That’s our rule. And we stand by it. So, let’s have a conversation. It’s what we do, it’s what we’re good at. Financial Advisors tell us they are frustrated. They say that nothing they try creates a consistent steam of quality introductions and qualified first appointments. They’re looking for an approach that is uncomplicated and efficient. This is why Advisors come to us. It’s why we’re here. It’s what we do. An efficient, uncomplicated marketing approach should work quickly and enable Advisors to achieve significant and measurable increases in new warm qualified activity and first appointments in as little as 60 days. So, who are an Advisor’s potential advocates? They are your current qualified clients – the clients you want to duplicate. And you’ll find that they are very open to becoming your biggest champions and will help you identify and connect to warm qualified prospects. 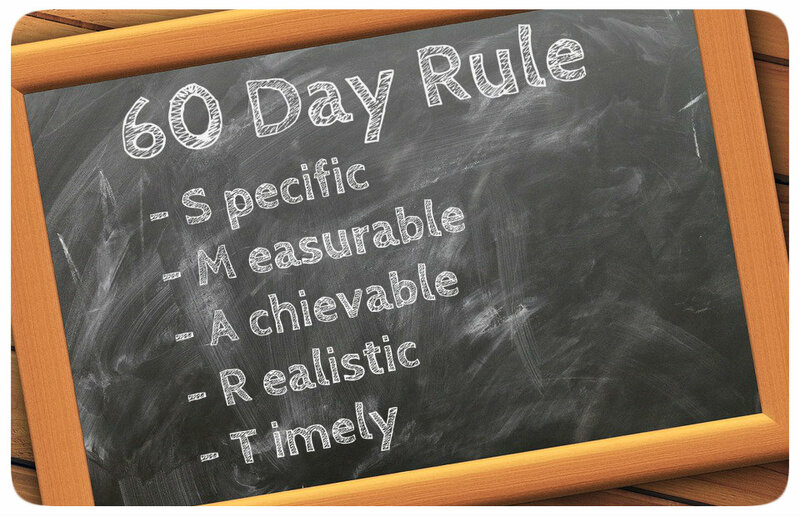 We are consultants to Advisors and our approach satisfies the “60 Day Rule”. We first teach Advisors to effectively address the worldview of the market. And they achieve measurable results – consistent new, warm, qualified activity within 60 days. So, try this. If you’ve consistently been qualified activity challenged and/or have been experiencing sluggish growth, give us a call. Or if after 60 days or so of doing what you are currently doing – you haven’t created a substantial increase in qualified activity, recognize that your approach isn’t working the way it should, give us a call. A conversation may be the initial step that helps you move the growth trajectory of your business to a really good place…and it doesn’t cost money. It’s free.